Tim Baster and Isabelle Merminod are optimistic about Spain’s big movement for change. They chanted ‘Yes, it is possible!’ Hundreds of thousands of demonstrators were in Madrid’s Puerta del Sol and side streets on Saturday 31 January for the first national rally of Podemos, Spain’s big movement for change. In 2011, the Indignados (15M) movement occupied Puerta del Sol. Young people with over 50 per cent unemployment topping demanded a future from the rich Spanish in power who wanted neoliberal policies and austerity. After the occupation, they started organizing. Occupy movements spread in the West and the Arab spring started. The Spanish people started a big anti-austerity movement across Spain. They stopped evictions of houses, built movements against privatization and fought against cuts in public services. Then, Podemos started in early 2014. Miguel Urban of Podemos Madrid said: ‘We had enough political honesty to see that everything else we tried had failed.’ He says that activists had to create a clear national political challenge to the neoliberal policies. Germán Cano, also from the National Citizens’ Council, said that the Spanish Left thought 15M was amazing. It made them think again about what they were doing and saying. Podemos was formally registered on March 2014. Isabelle Alba says it was a rush to get organised for the European Parliament elections on 25 May 2014. With no national organization and only three months to organize, Podemos won five seats in the European Parliament with nearly 8 per cent of the vote. In 2014, people were setting up groups in local areas and in workplaces to defend public services. Alba says there are about 800 groups now across Spain. At the end of 2014 Podemos had their first national assembly. They voted for a 62-member national ‘Citizens Council’ and organizational and political documents. They have an Ethical Code: Podemos representatives work to get back control and democracy for the people. Alba says that Podemos does not have ‘members’. But 200,000 people have ‘signed up’. She says that anyone can vote – you just sign up. It is not a traditional political party with a membership. 2015 is the year of elections in Spain. Andalucía has regional elections in March. In May there are municipal elections and elections in 13 regions including Madrid. Cataluña has elections in September. National elections will be in November. Recent polls (surveys) to find out what people will vote say Podemos is in first or second place (after the rightwing Partido Popular - PP). 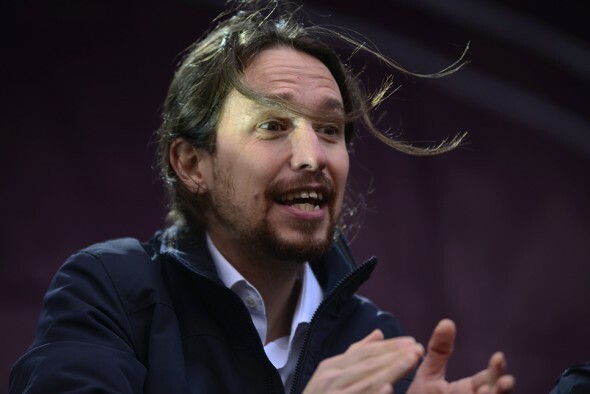 Podemos supporters hate ‘La Casta’ – the Caste. This is the corrupt political system of two parties (the PP and the Partido Socialista Obrero Español (PSOE)). They take turns to do the same thing: austerity and neoliberal polices. About a week ago, the ex-treasurer of the PP, Luis Bárcenas, was facing serious charges of corruption. He was surprisingly released on bail – this will delay his trial. Many people said that he was released so his trial wouldn’t take place during this year of elections - that would embarrass the PP. Carlos Fernández Liria, professor of philosophy, says that the people’s demands are not revolutionary. They want dignity; they want La Casta not to cheat them; and they want the basic necessities for life ... which are now disappearing. PAH, an organization fighting evictions, say there were 23,340 legal actions for repossessions of homes in the final quarter of 2014. This was 10-per-cent more than in 2013. Tens of thousands of evictions take place each year. 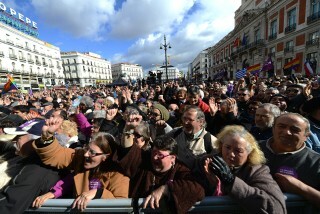 NOW READ THE ORIGINAL: http://newint.org/features/web-exclusive/2015/02/04/podemos-rally/ (This article has been simplified so the words, text structure and quotes may have been changed). This page was last edited on 7 February 2015, at 19:32.